GeoSea, a subsidiary of Belgian dredging, environmental and marine engineering group company DEME, has taken delivery of the self-propelled jack-up vessel Apollo, that was built in Croatia. In Flushing (Vlissingen) it has been mobilised for its first assignment: decommissioning of the Q1 Halfweg unmanned gas platform in the Dutch sector of the North Sea. The new vessel will join the current fleet of DP class, self-propelled jack-ups, which includes the Innovation, Neptune, Thor, Sea Installer and Sea Challenger. One of the exceptional features of the Apollo is its extremely long lattice legs of 106.8 metre, which allow the vessel to jack-up in water depths up to 70 metre. The vessel is equipped with an 800-tonne, leg-encircling crane. The vessel has a large, spacious 2000 m² deck, which is free of obstacles and has a load carrying capacity of 15 t/m². This versatile vessel will serve the offshore wind industry, but will mainly be deployed by DEME Group’s subsidiary EverSea to provide services to the oil and gas industry, with a particular focus on the installation and decommissioning of platform facilities. The contract for the decommissioning of the Q1 Halfweg has been awarded by Petrogas E&P Netherlands to EverSea, also a subsidiary of DEME. The scope of work comprises the engineering, preparation, removal and disposal of the 500-tonne topside, including the four foundation legs. The topside will be removed and transported to shore by the Apollo. Engineering works are already ongoing and the actual removal work is scheduled to take place at the end of this year. Petrogas E&P Netherlands is an independent O&G operator which has interests in 11 offshore blocks on the Dutch Continental Shelf. The Q1 Halfweg platform is a three-well unmanned gas production facility which was installed in 1995. It was designed for ‘self-installation’ and consists of a concrete gravity base which supports a normally unmanned process deck by means of four tubular steel legs in a 24 metre water depth. The platform ceased production in 2017 and the wells have been decommissioned. EverSea and DEME see this contract as an important milestone in the upcoming decommissioning market in the North Sea. In the Dutch sector alone, 77 of the remaining 150 platforms are due for removal by 2025. 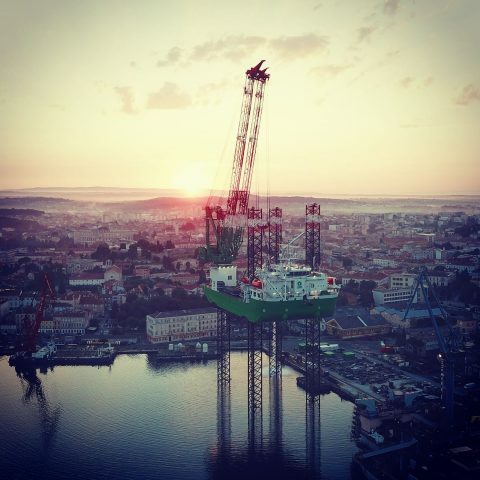 DEME’s fleet investment programme continues, with the dredgers Bonny River and Spartacus, and offshore installation vessel Orion currently being under construction. At Project Cargo Summit actual and future developments in the North Sea decommissioning market will be discussed: who will benefit? Find out more about the programme.